In a marked break from the heavier reading of graduate school, I’ve finally had the chance to read something a little less dense, albeit perhaps equally philosophical in its own way. 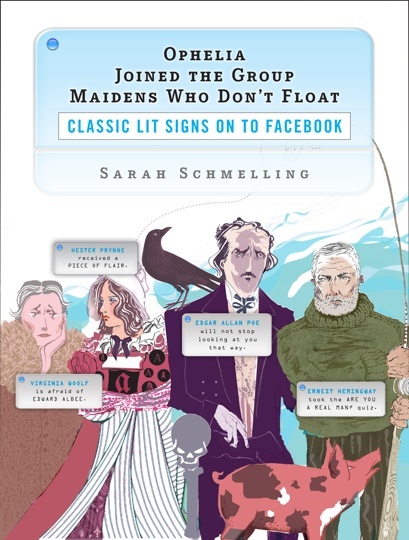 I’m referring to a book with the intriguing title: Ophelia Joined the Group Maidens Who Don’t Float: Classic Lit Signs on to Facebook, by Sarah Schmelling. I first encountered Schmelling when her essay “Hamlet: Facebook News Feed Edition” exploded into popularity. Her book (Plume 2009) takes the humorous thread of her earlier work and runs with it…and keeps on running. Other tantalizing snippets, as well as links to purchase the book, are available on Schmelling’s website. E-Book: Bane of the Literati? A few weeks ago, the Wall-Street Journal published: How the E-Book Will Change the Way We Read and Write. After reading a few commentaries on the subject, I decided it was time to take a look at the original and consider some of its conclusions. New innovation as book collections become broadly available. The growth of book sales via impulse buys. A decline in books finished as competition increases. Increasing intertextuality and less authoritative scholarship. An increase in writing for search-engine optimization. Rise of fragmentation and sensationalism. Taking a step back for a moment, many of these phenomena are not new. The E-Book is escalating, rather than inventing, trends in reading and writing that have characterized the postmodern era of blogs, graphic novels, and film-to-book series. That said, I do think the digitalization of books will cost us something. In an era when science fiction and fantasy, spearheaded by Lord of the Rings, Harry Potter, His Dark Materials, and Twilight, are all the rage, I think we run the risk of forgetting how to engage with smaller, quieter, thoughtful worlds like those of Jane Austen, Fyodor Dostoyevsky, or Pearl Buck. The ability to think deeply about a complex subject that cannot be reduced to sound bytes is also compromised as our attention spans continue to shrink. Print-on-demand publishing now allows more books to be published than ever. If an author’s first concern is search-engine optimization and capturing the reader in that first paragraph, depth and creativity lose something in the bargain. The values of quick consumerism become mirrored in the types of novels that sell, and, by consequence, in the types that are written. And the spiral continues. I think it is important to remember, however, that dime novels have been around since the 1860s, and yet somehow, Crane’s Red Badge of Courage was still written and still read. And although bear-baitings and public executions raised crowds on the streets of Elizabethan England, Hamlet still captivated audiences in the Globe. Will the 21st century produce the same quality of literature as earlier ages? Perhaps not. Will more voices join the conversation? I hope so. Will great literature still have the ability to reach out from the mass of competing texts and touch lives? Without a doubt. I couldn’t resist posting a link to this circulating (genius) adaptation of Shakespeare’s Hamlet to new media. Behold, *drum roll please,* the story of Hamlet, prince of Denmark, as it unfolded on Facebook: Hamlet (Facebook News Feed Edition) by Sarah Schmelling. Check it out for a good laugh. Turning to the lighter side, in honor of that paragon of holidays, Valentines Day (known on the black market as Singles Awareness Day, Hallmark Appreciation Day, and other such pseudonyms), I’ve decided to spend a few days/posts invoking the Bard in less-than-typical ways (i.e. NO Romeo and Juliet in sight). My philosophy has always been, what’s the use of memorizing something if you can’t creatively tweak it later? So, (see “Brain Work” at the top of the page) the monologues I’ve memorized in the last few years are about to get a V-Day makeover. What do Hamlet, the color red, and hair have in common? You’re about to find out. With no further ado (about nothing), welcome to the pre-Valentines special at Hamlet’s beauty parlor! And lose the name of business.